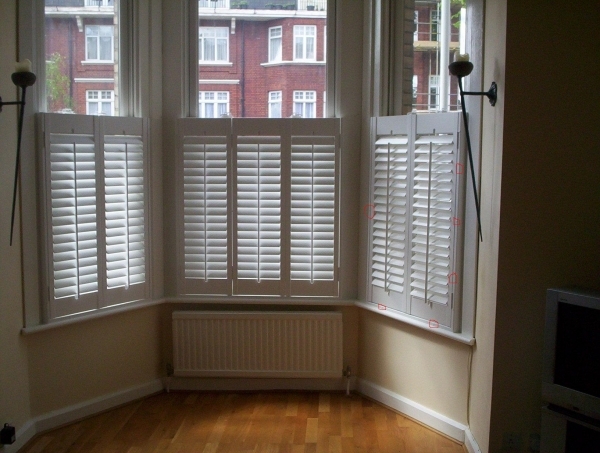 Lounge window in Willesden, NW10 is fitted with café style Shutters. Contemporary interior shutters are thought to originate from many different places, often likened to plantation shutters from Colonial USA, or perhaps the Victorian and Georgian solid shutters popular in Willesden and other areas of London. In regency style town houses, some of the original wooden shutters still exist at windows and can be bought from salvage yards. Other well known shutters are those from Ancient Greece, made from solid marble (obviously these differentiate themselves from the contemporary window shutters of today as these didn’t have slats which could pivot and turn). Lots of customers looking for café shutters in contemporary surroundings are particularly looking for plantation shutters. This rural yet bijou style of decoration, is chic, but with an elegant country twist. Although our Shutterly Fabulous shutters don’t have particular ranges, you can create your own contemporary finish by choosing the colour, slat size, how many panels you have. The beauty of the Shutterly Fabulous contemporary window shutters is that they are bespoke for your own interior. These café style bay window shutters are in vogue and give a beautiful contemporary look to windows. Having window shutters painted in a white, or off white again helps towards this contemporary look. Matching the shutters to your walls or furnishings keeps all aspects of your interior uniformed, giving a contemporary plantation shutters feel to the whole look. Our Willesden, NW10 customer was inspired by a family friend’s shutters in Shepherds Bush, W12. The contemporary window treatment in this Willesden property are a Café style sunshine bay window covering, meaning that the plantation shutters only travel half way up the window, or finish at a point where you want them to, perhaps to match up to a bar already travelling across your window. This contemporary look is called Café Style as it’s reminiscent of café’s and bistros in regions of Europe. Our shutters for sale offer the UK’s most competitive installed shutter prices.